Summer is almost over and winter will be here before we know it, so we are taking advantage of the unseasonably clement weather to waterproof the house. The painter was keen to start power-washing the house while the weather was still warm and last week they washed away seven years of mold, moss and dirt to reveal the beautiful redwood beneath. We had no idea that it would come up so beautifully - from grey to amber in two days. 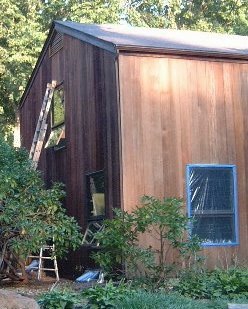 I almost wanted to leave it at that but I am persuaded that a coat of Cabot Clear Pacific Redwood Stain will actually protect the siding for the next 3-5 years. The staining process began this morning and already three of the twelve sides have been stained. So far so much better. Can't wait to see it with the freshly painted windows and doors, and then we can get the roofers in to make us completely watertight.